Visiting with the Steelers is in an interesting angle. They’ve only got $5.3m in spare cap room — and that’s without considering a rookie draft class, practise squad and injured reserve list. Unless Okung is willing to play for a few bucks in 2016 — the Steelers are a highly unlikely destination. They’d have to offer him a long term deal that is severely backloaded. So why make the visit? As this process drifts on — it appears nobody is willing to pony up a substantial multi-year contract. He would’ve signed otherwise, wouldn’t he? Perhaps Detroit, the Giants or lingering San Francisco will come up with the goods in the next 24 hours? It’s not impossible. Yet the longer this drags on — does it increase the chances of Okung returning to Seattle? After all, if he’s signing a one-year contract to return to free agency in better health next year, why not just stay with the Seahawks? There are a couple of thoughts here. Firstly, it might be better for Okung’s stock and health to play in a less aggressive, pass-friendly offense. Seattle’s system is based around physically pounding the ball in the run game and Okung isn’t the only one to suffer injuries over the years. James Carpenter, Max Unger, Breno Giacomini — they’ve all missed time. If he plays in 16 games next season his stock will receive a boost when he returns to the market. Secondly, playing in a pass-friendly offense plays to his skill-set. Pass-blocking for a quarterback like Matt Stafford should be relatively straight forward for Okung. That’s a major shift from having to protect the blindside of a scrambling, creative quarterback who frequently leaves the pocket. The best way for Okung to advertise himself in 2016 is to play in Detroit’s offense, in their dome for 16 injury-free games. It arguably gives him the best opportunity to shine. That could be the reason Michael Silver says the Lions are favourites. What keeps Seattle in the game is Okung’s attachment to the area, the likelihood they can compete on price and they’re a contender. They have $12.7m in free cap room — enough to make a somewhat attractive offer for the next year or two. Just got off the phone with free agent OT Kelvin Beachum. He told me he's traveling Sunday for a visit with the #Jaguars Monday. Beachum was reportedly set to visit the Seahawks on Monday — but he’s now going to the Jags. It’s a curious move because the Jaguars already intend to start Luke Joeckel at left tackle. Beachum can play guard but made it clear to Pittsburgh he wants to continue protecting the edge. With the Seahawks needing a tackle if Okung departs — surely it would’ve made sense to take the trip to the North West? Maybe he’ll still visit after heading to Florida? It might be a sign that Seattle is confident they will get either Okung or Donald Penn one way or the other — and that has been made clear to Beachum. A resolution to this situation appears close. Multiple reports are linking the Seahawks with interest in Kelvin Beachum and Donald Penn as well as Russell Okung. Today Okung visits with the Giants and possibly the Lions. Adding a tackle makes a great deal of sense for obvious reasons — and all three are likely to be short term measures. Beachum will likely get a shorter deal after tearing his ACL, Penn is 33 this year and Okung is nursing an injured shoulder. Of the three, Okung is most likely to sign a multi-year contract. Any of the trio will provide the Seahawks with at least some security going into the draft. Taking an offensive lineman at #26 would still be a strong possibility because the likes of Germain Ifedi, Jack Conklin, Taylor Decker, Shon Coleman and Jason Spriggs all project well to left guard. In the future they could move back to tackle. However — if the top tackles are off the board at #26 or they just want to go in a different direction, having a possible starter already in place at tackle gives the team that little bit more flexibility. Okung is almost certainly the preferred option, with Beachum and Penn the fall backs. — Jon Ryan has announced he’s staying in Seattle. It’s a four-year contract worth $10m. — Former Pittsburgh left tackle Kelvin Beachum is set to visit with the Seahawks on Monday according to Ian Rapoport. The Steelers want Beachum to kick inside to guard after he lost his job on the blindside after tearing an ACL. He’s just under 6-3 so doesn’t have prototype size for a tackle. He could be a nice hedge for the draft (and could still kick inside for the Seahawks). — Rapoport also says defensive tackle Al Woods is visiting Seattle along with Cam Thomas. Woods spent time with the Seahawks in 2011. — May Kay Cabot says Cleveland linebacker Craig Robertson will visit the Seahawks. Offensive lineman J’Marcus Webb also adds to the growing number of visitors to the VMAC. A lot of these moves will be based on added competition and hedges for the draft. — As expected the Seahawks have been awarded three compensatory picks in rounds three, five and six. That’s the 97th, 171st and 215th overall selections — taking their total overall to nine. — The Browns have signed Alvin Bailey. The Seahawks need a new swing tackle (and they will find one, easily). Remember this? Size, length, athleticism: Who stands out? This is a pretty interesting website. It calculates a physical profile for draft prospects called ‘SLA’ (Size, Length, Athleticism). One of the issues with SPARQ is its inability to account for height and length. Teams generally have adapted their own analytics based off SPARQ. Given Seattle’s desire for uniqueness — it wouldn’t be a total shock if they paid attention to size specific rarity. Why should we pay attention to this? Take K.J. Wright for example. He ran a 4.75 at the 2011 combine with a 32-inch vertical. These aren’t great numbers. His size and length however were very interesting (6-3, 246lbs, 35 inch arms). I don’t know Wright’s ‘SLA’ score — but it could’ve helped us identify his unique traits without just looking at the forty yard dash or vertical jump etc. While the Seahawks have generally identified the best athletes available — size and length if combined with grit also seems to appeal. Germain Ifedi is ranked in the 98th percentile for NFL offensive linemen based on his SLA profile. It’s not a big surprise given his size (6-6, 324lbs), length (36 inch arms) and explosive athleticism (32.5 inch vertical). He’s the #1 ranked physical freak in this draft class on the O-line. Also included in the top ten are Missouri’s Connor McGovern (#4), Ryan Kelly (#8), Alex Lewis (#9) and Graham Glasgow (#10). McGovern also tested very highly according to SPARQ and looks like a lock to be a Seahawks draft target. He has tackle experience but is likely a guard or center in Seattle. Kelly looked terrific at the combine — a truly underrated performer. His combination of size, physicality and mobility could get him into round one. Lewis is a mid-round tackle project while Glasgow provides size, length and intensity at guard or center. Like McGovern he could be an interior line target for the Seahawks in the round three range. The likes of Joe Dahl and Nick Martin — while really tough football players — might not have the size or athletic profile to interest the Seahawks. Emmanuel Ogbah is ranked #1 with a fantastic SPARQ and SLA score. He’s in the 93rd percentile for the NFL and pretty much wipes the floor among his peers. His college production is also excellent and in many ways he looks like a top-20 pick. His motor runs hot and cold and teams will be keen to check that side of his game to see if it matches his elite physicality. Highlighting the sparse edge options in this class, only three players grade above the 67th percentile (Ogbah, Alex McCallister and Dadi Nicholas). It’s safe to say that unless the Seahawks have their heart set on drafting Ogabh — they’re highly unlikely to take an edge rusher at #26. Shaq Lawson, for example, is in the 43rd percentile for the league. While it’s considered a very deep defensive tackle class — there aren’t a ton of outstanding athletes among the group. SPARQ’S favourite is Connor Wujciak from Boston College. The top four players according to ‘SLA’ are (in order) — Shawn Oakman, DeForest Buckner, Bronson Kaufusi and Joel Heath. Buckner aside — there’s very little to get excited about with that quartet. 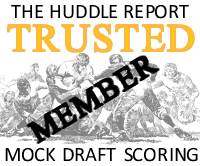 Wujciak and Jonathan Bullard are the only two other prospects grading above the 75th percentile in the NFL. It raises an interesting point. If SPARQ, SLA and other measures are grading Sheldon Rankins, A’Shawn Robinson and Chris Jones in the same range as Willie Henry, Javon Hargrave and Anthony Zettel — why exactly are people so keen for the Seahawks to go with a defensive lineman in round one? This data, if anything, illustrates that the physical difference between the players going in round one and rounds 2-4 will be minimal. And there are very few ‘freaks’. Compare that to the O-liners in this draft. The top three in SLA (Ifedi, Conklin, Spriggs) grade between the 96th and 98th percentile in the entire NFL. All three are expected to be off the board in day one. If the Seahawks love physical freaks in round one, they’ll struggle to find a defensive lineman or edge rusher that fits the profile at #26. This was fascinating. Darron Lee is ranked #1 (no shocks there) with Travis Feeney at #2. Feeney is in the 94th percentile which is outstanding. Vanderbilt’s Stephen Weatherly — who could convert to an edge rusher in the NFL — was third in the 92nd percentile. Both players could provide the Seahawks with pass-rushing/playmaking options beyond the first round. Here’s the interesting bit though — Ohio State’s Joshua Perry is at #4 and in the 87th percentile. SPARQ also rates him generously. There are very few guys in this draft I had more fun watching than Perry. While he doesn’t wow you on the field in the way Darron Lee does — there’s just a great physicality to his game. The rumours tentatively linking the Seahawks to Denver’s Brandon Marshall did make me consider whether they’d possibly look at Perry (if there was anything in the reported interest). He isn’t a burner — but he’s a high-intensity, big hitting, run-and-hit type that sets a tone. He’s 6-4, 254lbs and ran a 4.68 at the combine. He has 34 inch arms and had an outstanding 10-4 in the broad jump. He’s faster than Wright and similar in size. He might be too similar to have in the same team — but we know they think Wright is flexible enough to play the WILL and SAM. It’s food for thought. Feeney clearly provides a fantastic option health permitting. His experience at safety, ability to make plays and rush the passer (eight sacks in 2015) — plus his personality and size/length/athleticism make him virtually an ideal candidate for the Seahawks. Receiver is less of a need following Jermaine Kearse’s decision to return to the Seahawks. Devon Cajuste is the #1 SLA prospect and has ties to Doug Baldwin. Marquez North is at #3 — someone we’ve talked about a lot on this blog over the years. Both players rank in the 88th-91st percentile. Derrick Henry is in the 93rd percentile for running backs. He’s just a special athlete and it’s time people recognised that more than his size. Watching him work as a receiver at the Alabama pro-day confirmed that. He pretty much ticks every box — production, character, athleticism, uniqueness. It’s not an attractive list of running backs aside from Henry. This might be an area where they look to add a couple of cheap veterans. Keanu Neal is the #3 safety but projects in the 90th percentile. Few players impressed me more on the first go-through than Neal this off-season. Like Henry — he is pretty much the complete package. Size, character, athleticism, production. It’s hard to imagine he won’t be a first round pick. If the Seahawks target a cornerback on day three, SLA suggests DeAndre Elliott and Daryl Worley could be targets. Basically that we aren’t far off projecting that the Seahawks could take a freak-of-nature offensive lineman in round one and possibly a linebacker in round two. With two picks in round three they can use the defensive tackle depth to their advantage and add an interior offensive lineman. You can play around with the variations. Defensive tackle in round two instead, linebacker in round three. There will also be options at cornerback — as usual — on day three. Round four could also be a good spot to add a run-stuffing project such as Clemson’s D.J. Reader. The one area that is unclear is running back — but it’s safe to assume they’ll find some prospects they like (and could still look to free agency). A lot of Seahawks fans will be concerned about Russell Okung’s pending visits to New York (Giants) and Detroit on Friday. The prospect of adding a rookie replacement will concern some. However, it’s arguably Seattle’s most likely scenario considering this data and their draft history so far. Even if they sign Donald Penn as a short-term measure (or Okung), Ifedi, Conklin and Spriggs (the top three SLA OL’s) could all line-up at left guard (a particularly good fit for Ifedi and Conklin) before reverting to tackle in the future. It’s been very quiet regarding Russell Okung so far. This might be the product of no agent to contact Ian Rapoport, Adam Schefter and Rand Getlin. The longer it stays quiet the greater the advantage for Seattle. Ideally he returns on a short-term contract at a team-friendly cost. It’s unclear whether Okung would be interested in such a pact given he turns 29 in October. Thomas is a pure run-stuffer who played some DE and nose tackle in Pittsburgh. According to Steelers Depot, Pittsburgh limited opponents to 3.4 YPC when Thomas was on the field. The Seahawks are very clear in their methods. While many have questioned whether they will look to bring in a base defender who can rush the passer — that has never really been part of this defense. Even in 2013 when they won the Super Bowl they started Red Bryant, Brandon Mebane and Tony McDaniel in base. Seattle prioritises gap discipline and run defense for the early downs — before unleashing their pass rushers in favourable down/distance situations. Thomas isn’t a special player — but he’s a cheap veteran run-stuffer who can start next to their 330lbs three-technique. When we ran through some free agency predictions a week ago — we looked at the possibility of keeping Ahtyba Rubin and replacing Mebane with a cheaper option — while prioritising Jeremy Lane. Assuming they sign Thomas or a similar player — the key will be rekindling the lost production from their interior pass rush specialists. In 2013 Clinton McDonald provided 5.5 sacks. In 2014 Jordan Hill provided 5.5 sacks. In 2015 Hill provided zero sacks. There’s the issue — and it’s an area they should be able to solve between rounds 2-4 in the draft thanks to a deep DT class. Why weren’t they more active? Did you really expect them to be? With limited cap space and a self-confessed desire to keep their own free agents — this was always likely to be a quiet opening stanza for the Seahawks. The Seahawks were never going to be able to compete with Oakland for a player like Kelechi Osemele — that was a pipe dream. And while Alex Boone’s $26.8m deal with the Vikings looks like a bargain — is it really? Boone played well during the Jim Harbaugh years but is extremely tall for a guard (6-8), he turns 29 in May and is limited athletically (he was an UDFA despite playing for Ohio State). He’s a tough guy but the fact he was an UDFA speaks volumes to the range where you can find guys with his skill-set without paying +$6.5m a year. Replacing Mebane and finding common ground with Russell Okung are the next two key steps for the Seahawks. — Rapoport says it’s $23m over four-years for Lane in Seattle, with $11m guaranteed. — Adam Caplan is reporting the Seahawks are interested in former Arizona interior lineman Ted Larsen. He played with Russell Wilson at NC State. — Josh Weinfuss says the Seahawks will visit with another former Cardinals O-liner in Bradley Sowell. Sowell is listed at 6-7 and 320lbs so could theoretically compete at right tackle or left guard for the Seahawks. — O’Brien Schofield could be returning to Seattle, according to Josina Anderson. — Adam Schefter says Jermaine Kearse WILL be returning to the Seahawks. What a turnaround — just a few days after he appeared to be moving on. This is good news. Kearse has made a ton of vital plays for this team and has a rapport with Russell Wilson. He’ll get $13.5m. — Russell Okung meanwhile is set to visit with the Giants and Lions, per Ian Rapoport. Free agency officially begins at 1pm PST — but plenty of deals have already been confirmed. Kenny and I talked through some of those and what lies ahead in today’s podcast (see above). I will update this post as news come in affecting the Seahawks. The key to Seattle’s off-season really is the future of Russell Okung. If he were to re-sign with the Seahawks — even on a short term contract — it gives them some flexibility in the draft. If he departs and they don’t add a replacement, they almost have to take an offensive tackle with the #26 pick. As you can see, there isn’t a lot of scope to be active unless they fail to re-sign any of their existing players (something they stress is a priority). If they choose to draft a punter instead of re-signing Jon Ryan, they’ll have an extra $1.5m to play with. On top of Okung’s future, Jeremy Lane’s situation is very intriguing. How much is he going to be offered on the open market? And how far are the Seahawks willing to stretch to keep him? Denver linebacker Brandon Marshall and Miami receiver Rishard Matthews have been linked to the Seahawks. Marshall has been tagged as a restricted free agent and would cost Seattle’s #56 pick. Matthews is an efficient wideout in the mould of Jermaine Kearse. Donald Penn referred to interest by Seattle in a NFL Network spot yesterday. Ex-Seattle DE Chris Clemons is on his way to the Pacific Northwest now to visit the Seahawks, per source. If things go well, he could sign. — Here’s another name to throw into the mix — Cedric Thornton from the Eagles. He’s 6-4 and 309lbs and would be a nice addition to the D-line rotation. He was undrafted in 2011 and played end for the Eagles. The #Cowboys and #Seahawks are among the teams interested in #Eagles DL Cedric Thornton. His market's starting to heat up. — Rapoport is now suggesting the Seahawks are making a late push to keep Okung with a “strong offer”. He won’t be able to negotiate with other teams until free agency begins because he’s representing himself. — In non-free agency news, Rapoport also says Jimmy Graham is on pace to return to action in week one for the Seahawks. We've agreed to terms on a three year deal with NT Brandon Mebane. This is a blow for the Seahawks. They’ll likely need to replace Mebane in free agency. This could be why they’re showing interest in Cedric Thornton. Mike Garafolo says the Seahawks made an attempt keep Sweezy. This isn’t a big shock considering the expensive guard market and the reported interest in Sweezy (Stroud says a dozen teams were interested). Mark Glowinski is a ready made replacement at right guard. Sounds like it is between the Titans, Patriots and Seahawks for soon to be former Dolphins receiver Rishard Matthews. CB Jeremy Lane stays with the #Seahawks, source said. Last week we considered the possibility that Lane would be a top priority. The Seahawks needed some consistency at cornerback after watching Brandon Browner and Byron Maxwell depart and Cary Williams flop. Lane’s ability to play inside and out will be crucial. They have a stable of younger guys to provide depth behind Lane, Richard Sherman and DeShawn Shead. It’s a four-year deal so it’s a long-term commitment. As noted above — the key now is Okung. If he stays — they have flexibility in the draft and can consider a number of different positions at #26. If he departs and they don’t sign a replacement — they pretty much have to go offensive tackle in round one. Told Phil Loadholt is a done deal. Back to #Vikings. $2M base. Can earn up to $3.5M with incentives. If the Seahawks were interested in Loadholt, they’ll need a Plan B.
I’ll update this post accordingly if anything else ‘Hawks related emerges on day one of the legal tampering period. Marshall only ran a 4.81 at his combine in 2012 so he’s not the kind of athlete they’ve generally gone for. They are likely to need to replace Bruce Irvin. This would be one way of doing it — using their second rounder on a 26-year-old veteran. No surprises here that Rubin re-signed. Pete Carroll praised him as the best three technique he’d had in Seattle. This is a positive move to begin free agency. Free agency essentially starts tomorrow at 12pm EST. That’s when teams can begin the legal tampering stage and last year a lot of deals were leaked during this process. When the actual market opened — a lot of the interesting moves had been verbally concluded. With Seattle determined to keep their own guys first and foremost — it’ll be the defining point of their 2016 free agency period. Who do they need to replace? How much money will they have to spend? The best veteran left tackle option for the Seahawks is, without doubt, retaining Russell Okung. Despite the injuries, he’s clearly the best player available. That could work against the Seahawks as he tests free agency. According to Mike Florio, Okung won’t be able to speak to teams on Monday even though he’s representing himself. If he wants to discuss terms personally as a player, he’ll have to wait until Wednesday. Such are the rules. Mitchell Schwartz will likely get overpaid to play right tackle, Donald Penn is 33 next month and will command a big salary. There really isn’t an attractive alternative to Okung. Saying it’s an average free agent group of tackles would be a compliment. It’ll be interesting to see how the Seahawks approach this one. They’re unlikely to go straight in with a big offer — mainly because they can’t afford to. It’ll probably be a case of testing the water, seeing if his market is cold due to his shoulder injury and then trying to work out a deal. If a team like Detroit comes in heavy for Okung — the Seahawks are likely going to have to address their need at the position with the #26 pick in the draft. My guess at Seattle’s approach is this — they’ll be interested in keeping him but certainly not at any cost and strictly on their terms. The Seahawks have developed into a team that not only values these extra picks — but appears to be scheming to get them. This year they’ll get an extra third rounder after Byron Maxwell’s expensive move to Philadelphia. If Bruce Irvin and Russell Okung hit the jackpot this week — they could be looking at extra third or fourth round picks in 2017. With compensatory picks also becoming trade bait next year, they’ll be more valuable than ever. So what are some of the moves they could make to avoid losing their picks should the likes of Irvin and Okung depart? The Vikings have told Loadholt and Mike Wallace they’d like to keep both — but only if they take a significant pay cut. Loadholt’s cap hit in 2016 is $7.75m. It appears likely he will be cut and if he is — he wouldn’t count against Seattle’s compensatory picks. Why is he a good fit for the Seahawks? He can play left guard or right tackle and they’ve consistently looked for guards with tackle experience. They’ve also looked for mauling left guards with massive size that excel in the run game. Loadholt has previous experience with Darrell Bevell in Minnesota. His major issue in the pro’s has been working against speed off the edge. If he moves inside to guard, you take away his biggest weakness and accentuate his ability in the run game. He could also be cheap after missing the entire 2015 season through injury. Loadholt would also provide a hedge option at right tackle if the Seahawks are unable to retain Okung and see a rush on offensive tackles in the first round of the draft. Why make this move over some of the other options? The likes of Kelechi Osemele are going to get paid — likely beyond Seattle’s limit. You can forget about getting any good compensatory picks if you sign Osemele. You can probably forget about signing Osemele period. It wouldn’t be a surprise if Alex Boone and Brandon Brooks are also paid handsomely. They are possibly two players to monitor if their market is cold. The likes of Zane Beadles and Jahri Evans have regressed so much it’d feel like the second coming of Mike Wahle. The Seahawks have consistently used the second and third wave of free agency to find value at defensive tackle. They also seem to have a limit on how much they’re willing to spend. That’ll help in the battle for extra picks. Pete Carroll spoke highly of Randy Starks before a 2012 game against Miami. He was recently released by Cleveland and always seemed an ill-fit in their 3-4 defense. He’s better as a one-gap interior DT. He’s 33 in December but might have a good year left in him. His contract with the Browns was worth around $3.5m. That was probably out of Seattle’s range considering they signed Ahtyba Rubin for $2.6m. If his value dips below $3m this time — he could be in play. Ideally the Seahawks keep both Rubin and Brandon Mebane. Rubin in particular feels like a straight forward retain. It’s hard to judge Mebane’s value — his salary was nearly $6m in 2015 and he hasn’t tested the market since 2011. The Seahawks gave him $5m APY on his last deal. Is a team willing to give him $4m in 2016? Are the Seahawks willing to match it or will they seek to make a saving? That’s when a player like Starks could potentially come into play. Can they make a $1.5m saving at this position and is it worth it? It isn’t really — you can pick out a number of alternatives. Tony McDaniel is a free agent again and did a good job for the Seahawks before his release. Samie Lee Hill (Detroit) and Steve McLendon (Pittsburgh) might also be of interest. Wallace Gilberry has had a decent career essentially being a Clinton McDonald type interior rusher. He turns 32 this summer but again might have a year left in him. None of these options are likely to break the bank. Ian Williams is more of a ‘name’ and he’s younger (turns 27 this year). His stock might take a hit with the D-line depth in the draft, making him a possible target. Maybe that’s wishful thinking? Ian Rapoport reported on February 4th that the Seahawks, Cowboys and Raiders, “would be interested” if Murray was available via trade. It was a curious link. Having struggled through a disappointing 2015 season with the Eagles, Murray’s stock is much lower than it was a year ago when he led the league in rushing. He averaged 3.64 yards a carry and has seemingly been trying to get out of Philadelphia since the end of the season. The Seahawks are known to kick the tires on moves like this. Many deals don’t come off and there’s nothing to say this one would. Let me create an argument for why they might be interested. Murray did produce in 2015 — and it wasn’t just down to the Dallas O-line. He was a genuine threat and as pivotal as Tony Romo and Dez Bryant. If the Seahawks believe he can get back to that form — pairing him with Thomas Rawls could produce a formidable rushing attack. Philadelphia and Murray appear to be so at odds that the compensation is likely to be minimal — maybe even a 2017 late round pick. A throwaway move to get him off the books. While the Eagles would have to stomach a $13m dead cap hit (ouch) — the Seahawks would currently pay him $8m. It’s a lot of money — but they’ve been willing to take on that type of salary in the past for Marshawn Lynch. Rapoport mentioned in his report that Murray might be willing to adjust his contract to force a trade. That could include limiting the dead money impact in Philadelphia and lowering his 2016 cap hit. Let’s say his cap hit is reduced to $6m. If it didn’t work out — the Seahawks could cut him with no charges. They could cut him in training camp if they wanted to. They could essentially bring him in for a trial to see if he warrants a $6m salary this year. The downside would be you took a chance and you move on. The upside could be 2014 DeMarco Murray at a decent price. Trading for Murray wouldn’t impact Seattle’s compensatory picks and it could give them a nasty one-two punch at running back. And remember — the Seahawks see the running game as their core identity on offense. Another veteran option — Matt Forte — would be cheaper but it could influence your compensatory picks. Murray is also only one year removed from a great season and he’s younger. It’s not a great draft at running back. The 2017 class is hotly anticipated at the position and the Seahawks might prefer to pair Rawls with a proven veteran. Such a move would only be likely if they lost all of their key free agents, had money to spend and were prepared to draft an offensive tackle in the draft. It’s a good trenches draft. If the Seahawks face a situation where they’ve lost Okung and Irvin — they might target replacements in round one and two. Bennett wouldn’t fill a vital need or necessarily replace a departing player — but he might just help the passing game in the absence of Jermaine Kearse and offer some relief while Jimmy Graham recovers from his injury. The Bears and Bennett have already announced they’re working to accommodate a trade so he’s unlikely to cost much more than a late round pick in 2016 or 2017. The Seahawks would be taking on a one-year contract essentially worth $6m. It’s not a cheap deal — but it might be similar to the amount they’d have to pay for someone like Miami receiver Rishard Matthews. The difference is — Matthews would impact their comp picks. Bennett wouldn’t. They’re not like-for-like players of course but they might be able to have the same impact. The Seahawks have shown interest in similar veterans in the past. Jared Allen was close to signing in 2014 before agreeing a longer deal in Chicago. Long was cut by the Rams so it wouldn’t impact Seattle’s comp picks in 2017. He has the kind of attitude and grit they seem to like. He’s had injury issues and a decrease in production for two years — but he always seemed to save his best football for the NFC West. Two of his three sacks last year came against the 49ers and Cardinals. He had 9.5 sacks against the NFC West in 2013 and 2014. The Seahawks were 3-3 in the division in 2015. He’ll turn 31 at the end of this month so he could still warrant a longer term deal like Allen (who signed for four years with the Bears). If his market is suitably cool and he’s willing to play for a season in Seattle — he could be an option. Mario Williams could earn twice as much as Long and is already getting serious interest on the open market. Charles Johnson is well beyond his best and Long looks like a better option if he can rekindle his form and stay healthy. Is Miami receiver Rishard Matthews a Seahawks target? Omar Kelly hinted on Twitter yesterday that the Seahawks are interested in Rishard Matthews. A former seventh round pick from the 2012 draft, Matthews has had a fairly unremarkable career. Kelly suggests he could warrant as much as $5m a year on the open market. Not convinced by PFF’s grading system? Football Outsiders ranked Matthews as the 17th most effective receiver in the NFL in 2015. Kearse came in at #19. Doug Baldwin was #2, Tyler Lockett #15. The Seahawks don’t throw as often as other teams. It’s not unrealistic to think they’d prefer efficient receivers over players that produced in pass-happy offenses. If they’re determined to replace Kearse with a similar receiver, this could be one to monitor. Or maybe interest would be indicative that the Seahawks are struggling to keep their own free agents? If Irvin, Lane, Okung, Kearse and Sweezy all get overpaid (at least beyond a comfortable amount for Seattle) — there’s not much they can do. Every player has a price. The Seahawks have signed their core players to extensions long before they get anywhere near free agency. This current group, as good as they might be, were allowed to run their contracts down. If the only pair they retain are Brandon Mebane and Ahtyba Rubin (and even they might move on) — they’ll have some money to spend (approximately $18m has been estimated). In the middle of a Championship window there’s little point holding onto it. Matthews would take some pressure off the passing game with Jimmy Graham injured, Kearse departing and Paul Richardson having a suspect injury record. They might also have enough free money to bolster the offensive and defensive lines. That’s assuming they lose virtually all of their valuable free agents. That still seems unlikely. They might be willing to overpay for one of their own. Jeremy Lane’s talent, ability to start at outside corner or the slot and familiarity with Seattle’s technique could make him a priority. A.J. Francis, Cooper Helfet, Eric Pinkins, Mo Seisay, DeShawn Shead and Steven Terrell all received tenders. There’s no news yet on why Burley was excluded. Seattle PI’s Stephen Cohen made a good point suggesting it could be a sign they’re confident in keeping Lane. Burley is purely a slot corner and Lane has played well moving inside. It’s virtually pointless not tendering Burley if you’re the Seahawks. As an exclusive rights free agent the contract is not guaranteed and there’s no signing bonus. They could cut Burley at any point and it wouldn’t cost them a dime. Even if they’ve chosen to move on without Burley — there’s little point not having the right to retain him. If they’re going to keep Lane, how much will it cost? And how much will be left to spend? The Seahawks were tight against the cap in 2014 and probably would’ve signed Allen but for that fact. If they find themselves with cash to spend next week — they’ll use it. That probably doesn’t mean a big splash on a top-tier free agent but they could be active in the second wave. Matthews could be one of many targets if their own free agents move on en masse.